What woman hasn’t looked in the mirror and wondered who was staring back at her? Or marveled at how grown up her children look? Or puzzled at how her friends are aging prematurely? 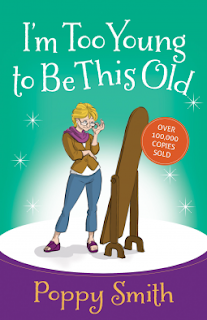 I’m Too Young to Be This Old is loaded with biblically informed wisdom and ample doses of humor. It will give readers the inspiration and insight they need to turn their middle years into the best years of their life! I HIGHLY recommend this book for women of faith who have happened to turn around one day and have the realization that, yes, or, "Oh, NO! I think I've hit middle age. Now what do I do?" Where did the years go? There is NO denying it, but we have hit that moment in our lives. Some of us may kick and scream as we start, or are going through it, but one look at our grown kids tells us there is NO denying it! Yes, we ARE in our middle years of life, and these are just beginning, but how did this happen to us because it sure feels like it was just yesterday when we were birthing them! This book also tells us how to continue our relationship with our grown adult children. Great advice. What about 'our' parents? The are now elderly, and it may be time for us to care for them. Yes, this time in our lives makes our parents that much older, too. They may or may not need our help yet, but it's about continuing our relationship with them, too. This is all new territory for us and them, well, for everyone in our lives. So this leaves us wondering and asking ourselves all kinds of questions such as where did the time go? When did this happen? How did this happen? I am no longer the invincible guru of youth! (My words there!) Now this takes us to wondering just who are we now? Who is this man I'm married to? He sure looks different, too! Gee, I've hit the middle of my life. I've hit all the milestones, so now what's left, where do I go from here and how do I get there? Who am "I" now, really? Along with many more questions that middle age haunts us women with. We look in the mirror and really do not know who is looking back at us. This body of ours has taken on added weight, and we don't know where that came from. So we have added a few extra pounds and our bodies definitely look different, especially our faces! They look like time has taken it’s liberty there! I've done it myself at certain periods of my own life, but now, especially, who am I, what happened to 'me', and where do I go from here? Some women seem to easily stride into it, and accept it willingly never asking any questions, but I believe the majority of us do quite the opposite and reflect on it much more than that. This is where this book is so helpful. This book has many different women talk about their life's struggles through this change in their lives, and it feels really 'good' to hear that they are feeling the same way we are. Poppy Smith uses just the right amount of humor and also adds Bible quotes and discussion in just the right places as it pertains to us and compares some of the many women in the Bible who also went through the middle life happening. This book gave me a new perspective and a new look at the women in the Bible and the women in the book as we compare ourselves to them. I loved that about this book. This would be a great book for you and your friends to discuss together, or even a great book club selection to discuss. Again, I HIGHLY recommended this book! I received this book for FREE from the publisher, Harvest House Publishers, through NetGalley in exchange to read and write a review about it. It is NOT required for this review to be either positive or negative, but of my own honest opinion. "Free" means I was provided with ZERO MONIES to read this book nor to write this review, but to enjoy the pure pleasure of reading it. I am disclosing this information in accordance with the Federal Trade Commission's 16 CFR, Part 255, http://www.access.gpo.gov/nara/cfr/waisidx_03/16cfr255_03.html Guides Concerning the Use of Endorsements and Testimonials in Advertising.